CULLMAN, Ala. – On Tuesday afternoon, Cullman County Board of Education (CCBOE) Superintendent Shane Barnette revealed “Project X” as a multi-use sports and event venue to be located in Cullman, on Alabama Highway 157 near its intersection with I-65. The facility will be located behind Warehouse Discount Groceries, on land donated to the CCBOE by Roy Drinkard. 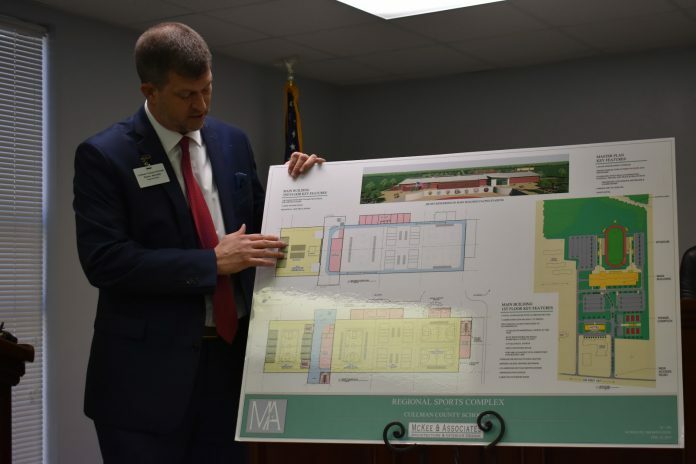 The new county half-cent sales tax, along with lodging tax money contributed by the Cullman Area Chamber of Commerce, will help fund the project which is projected to reach $30 million. Barnette explained that the project “has been developed to support all of our students, towns, and cities. This is a true investment in the future of our students with a self-sustaining business plan that will generate revenue to be used on our current campuses for years to come. The facility will include a stadium for football, soccer, and outdoor track events; as well as three indoor collegiate basketball courts that can be sectioned into eight high school courts with seating for up to 3,000, and a separate gym with a movable stage and seating for 1,400. When not in use for school functions, the complex will host sports tournaments, conventions, and conferences to generate self-sustaining revenue. Barnette also recognized Heather Wright from the Small Business Development Center, who is developing a business plan for the complex. The project is estimated to be capable of generating $10-12 million per year in revenue. CCBOE hopes to begin construction in the next year and estimates that the project will take 24 months to complete. Barnette also talked about the use of the half-cent sales tax to address issues with school safety/security and upgrading existing facilities.